Really? Is Coffee The Most Caffeinated Drink? Caffeine is complicated. While we often look to coffee to supply our daily caffeine intake, it turns out that caffeine content varies considerably from roast, to drink, to company, to preparation. There are a number of factors that determine how much caffeine is actually in that to-go cup in your hand, and some of them may surprise you. While caffeine has recently experienced something of an image makeover, even proving to be helpful in the fight against some medical conditions, it also has the potential danger of being too much of a good thing, the least being that it has slightly addictive properties. Ask any long time coffee drinker what mornings are like when they’ve discovered they’ve run out of coffee and you’ll begin to understand. How Much Amount Of Caffeine Is Healthy For A Person? Caffeine intake is personal. Some people are very sensitive to the effects of caffeine while others are not. According to Dr. Ananya Mandal, MD, the half-life of caffeine—that is, the amount of time it takes for your body to get rid of one-half of the caffeine it its system—is between 5 and 6 hours for a healthy adult. Some factors, such as smoking cigarettes and pregnancy can extend the half-life by as much a three times. Pregnant women especially are urged to limit caffeine intake as it can have adverse effects such as low birth weight and an increase of an early delivery. For others healthy adults, the United States Department of Agriculture’s dietary guidelines states that moderate caffeine intake, up to 400 mg of caffeine per day, can be safely incorporated into a healthy diet. What Factors Affect Caffeine Amount? On groggy mornings, when we feel the need for extra caffeine, we usually look for the biggest cup in the cupboard or drink an extra cup, or two. Makes sense. But there are other ways to bump up the amount of caffeine we consume (or decrease it). Different coffee bean varieties yield different amounts of caffeine. For instance, robusta has a 2.7% caffeine content, which is almost twice the amount of arabica, which delivers 1.5% caffeine. We can also alter caffeine by preparing coffee in different ways. Caffeine is water soluble, so generally, the longer the beans have contact with water, the more caffeine is extracted. But heat matters too. Hot water will speed up the extraction rate which is one reason why cold brews take more than 12 hours to brew and percolated and French press coffee delivers more caffeine in a short time. The same is true for roast type. Dark roasts generally have less caffeine than light roasts because they are roasted longer and lose more water which takes the caffeine with it. 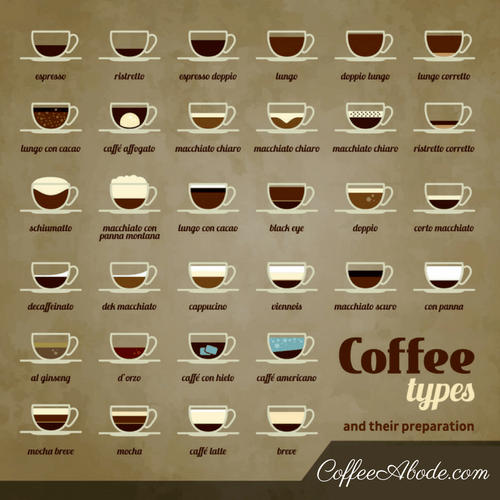 How Much Caffeine Is In Different Types Of Coffee Brews? Drip coffee is your typical everyday coffee brewed by an automatic coffee maker. Hot water is filtered through coffee grounds and “dripped” into a holding pot. Roasters often make blends designed especially for drip coffee. They don’t need to worry about developing the distinctive “crema” in non-espresso varieties, so they can experiment more broadly with different flavor profiles. Drip coffees can even be infused with specific flavors like, chocolate, vanilla, hazelnut, Irish cream and more. A drip coffee averages about 20 mg of caffeine per ounce or 160 mg for an 8-ounce serving. Espresso is made by forcing pressurized hot water through a small amount of finely ground coffee. The result is a concentrated one-ounce shot of strong coffee with a layer of foamy crema on top. An Espresso can be consumed just like it is, straight, from a small demitasse cup, or milk, water, or even drip coffee can be added to it. It is the base for almost every drink in your local coffee shop. An Espresso averages at around 63 mg per one-ounce shot. The average espresso drink contains 2 shots of espresso which makes the average espresso based coffee drink at around 126mg per 16-ounce cup. A French Press is a type of brewing device, usually made of glass, where hot water is poured directly over coarsely ground coffee and is allowed to steep like much like a tea. Those grounds are then “pressed” through the water with a plunger-like device and separated from the coffee which is then poured directly into a drinking cup. The result is a full-bodied complex tasting coffee with less flavorful oils lost through the automated drip brewing method. French Press coffee has an average of approximately 13mg of caffeine per fluid ounce or 104mg per 8-ounce cup. Percolators are simple coffee makers that work by convection and gravity. Coffee grounds are spooned into a filter basket over a pot of water that is heated either by electricity of over a stove-top or other external heat source. The heated water is then forced up through a perk tube to spill out over a filter basket and then drips through the coffee grounds into a holding pot. This cycle is then repeated until the heat source is removed. Caffeine content of percolated coffee is quite high, measuring in at an average of 25mg per fluid ounce or 200 mg per 8 ounce cup. Turkish coffee is a potent drink made in a Cezve Turkish coffee pot and served in small demitasse like cups. Very finely ground coffee is boiled in water, with or without sugar, and then served unfiltered. Since the grounds don’t dissolve, they sit on the bottom of the cup in what is called “mud.” This is one of the oldest methods of brewing coffee that is still used today. The amount of caffeine in Turkish coffee averages at around 25 mg per fluid ounce. However, since it is so strong, it is usually only consumed in small quantities, around two or three ounces at a time, so a 3-ounce serving of Turkish coffee contains about 75mg of caffeine. A Decaf coffee has had most of its caffeine removed most by chemical solvents or by what is known as the Swiss water process, which, in a nutshell, uses hot water to extract caffeine from raw beans. It used to be that the less flavorful robusta coffee beans were primarily used for decaffeinating as it yields a high percent of caffeine which can then be sold for other purposes. However, better beans are now being used resulting in better tasting decaf coffee. Even though it is called “decaffeinated” it is impossible to remove 100% of the caffeine. The average amount of caffeine in decaf coffee is still very low, around 0.7 mg per ounce or 5.6mg per 8 ounce serving. Instant coffee is made when coffee beans are roasted, ground, brewed, and then dehydrated. It became popular during the World Wars when technology was making breakthroughs and people were loving the less fussy way to make a cup of coffee at home or in the trenches. Just add water and drink. Today, interest in instant coffee fluctuates depending on where you are and the company you keep. Yet, despite the rise of Starbucks and part-time coffee hobbyists, instant coffee still remains quite popular throughout the world. The caffeine content in instant coffee is moderate, averaging around 7 mg per ounce, or 57 mg per 8-ounce cup. Starbucks is an American mega-chain coffee shop founded in Seattle, Washington in 1971 and now has over 28,000 stores around the world. The brand has unofficially revolutionised the modern coffee shop, making multi-adjective personalised to-go coffee cups something of a fixture of modern day life. They serve all the variable hot and cold coffee drinks along with signature products such as Frappuccinos, Teavana tea products, VIA instant coffee, seasonal drinks such as pumpkins spice lattes, and the occasional “limited time only” frappuccinos that are marketed to be photographed and shared through social media, such as #unicornfrappuccino. Starbucks brand coffee beans contain some of the highest amounts of caffeine of any chain coffee shop. For instance, their Pikes Place Brew Coffee clocks in at 155mg per 8-ounce cup and their Blonde Roast comes in at 180 mg per 8-ounce cup. Frappuccinos are generally lower in caffeine as they use espresso shots and “Frapp Roast” (which is something like concentrated coffee syrup, which doesn’t contain much caffeine in itself). A tall caramel frappuccino has 70mg of caffeine. On the lower end of the caffeine spectrum, a tall Teavana green tea latte has only 25 mg of caffeine. Dunkin Donuts is an American coffee house and pastry shop founded in Quincy, Massachusetts in 1950. There are now over 11,000 stores around the world. Dunkin Donuts is especially popular on the east coast of the United States, particularly in New England where it was founded. Impressively, Dunkin Donuts doesn’t just hold its own against Starbucks, but it outsells them in every head-head location. For instance, in New York City, there are 240 Starbucks compared with 350 Dunkin Donuts. Their menu items are all the common hot and cold coffees and some Dunkin Donut specific drinks such as blueberry iced coffee, coconut iced coffee, and the dunkaccino. 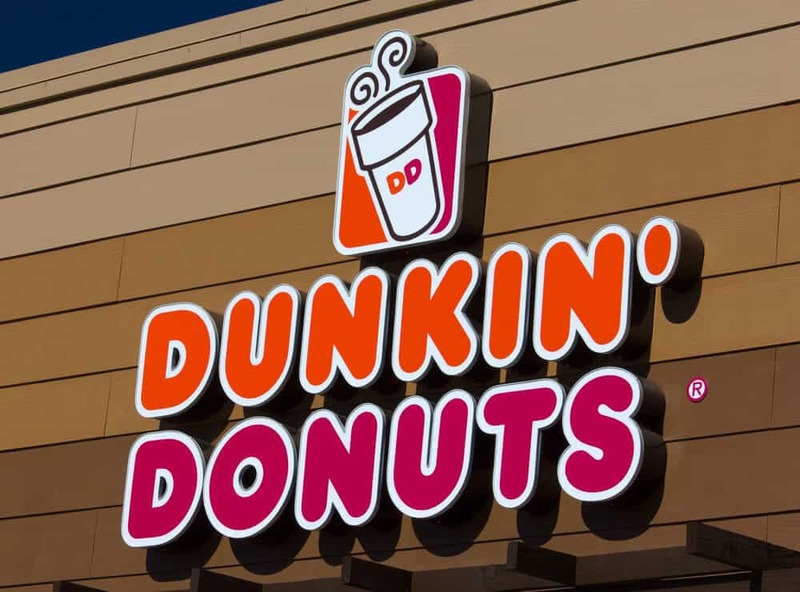 To compete with Starbucks, in 2015 Dunkin Donuts reformulated their drip coffee to have a higher caffeine content, and even temporarily increased the caffeine amount in their decaf to a whopping 75 mg of caffeine for a medium 12 ounce-cup. Their regular drip coffee averages at 150 mg for a small 10-ounce serving. A Dunkaccino has 56 mg per 10 ounce cup, and their decaf is back down to a reasonable 7mg per 10-ounce serving. Before Starbucks bought Seattle’s Best Coffee, or SBC, in 2003, the company started as a coffee roasting company and ice cream shop combo on Whidbey Island, Washington in 1969. 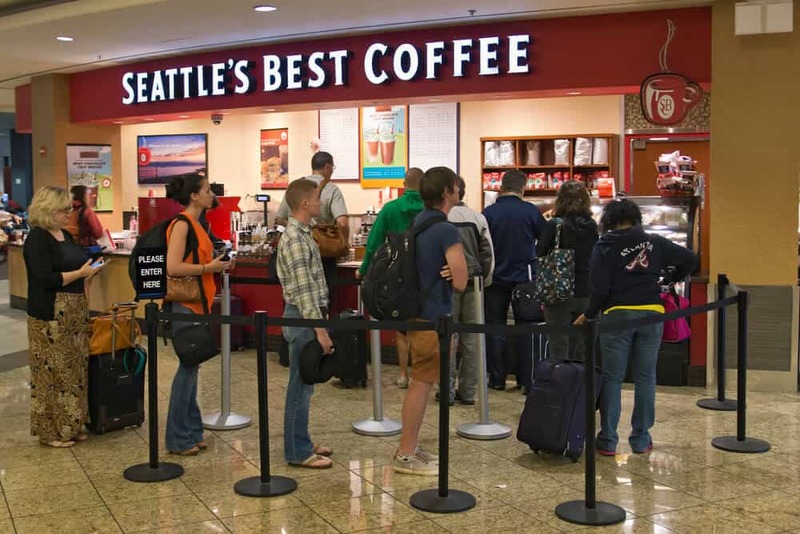 This brand sold and changed names a few times, but seem to hit its stride in 1991 when they won a local competition and renamed a final time to the aptly titled Seattle’s Best Coffee. The name was supposed to be a friendly jab at the other Seattle based coffee giant. Now, SBC operates mostly as a coffee roaster, drive-thru coffee shop, and as sub-stores located within other businesses such as JC Penny’s and on all of the Royal Caribbean Cruise lines. SBC’s products have been marketed as a less expensive alternative to their parent company’s coffee line. They serve hot and cold drinks, with regular brewed Seattle’s Best Coffee made with the being their most popular selling item. SBC’s brewed coffee has a caffeine content is on the higher end of around 260 mg for a 12-ounce serving or around 22 mg of caffeine per fluid ounce. The Frozen Caramel Candy Latte (SBC’s version of a frappaccino) has around 80 mg of caffeine for a 12-ounce serving. The Coffee Bean and Tea Leaf (CBTL) is a California based coffee and shop with over 1000 stores worldwide. This company began in the Los Angeles Brentwood neighborhood by Herman Hyman in 1968 and helped to usher in the new era of hipster coffee aficionados. Hyman broadened the customer coffee experience by letting them witness and interact with the process of roasting coffee; informing them what country the coffee came from, allowing them to see the roasting process, and by letting them sample different varieties of coffee before buying. In 1996 the company was sold to Victor and Sunny Sassoon who began an aggressive expansion project and doubled the amount of stores in the US and Asia. CBTL’s coffee caffeine content is quite high, and as been listed by some publications as the highest caffeine content coffee of any store chain. Their regular brewed coffee measures in at around 250mg per 12 ounces, or 21mg per ounce. One of their most popular drinks is the chai latte which has around 95 mg of caffeine for a 16-ounce serving. Dutch Bros. Coffee is a drive-thru coffee chain that originated in Grants Pass, Oregon in 1992 by dairy farmer brothers, Dane and Travis Boersma. The brand now have 300 stores in the western part of the United States. They pride themselves on being a privately owned coffee company, meaning they have a small number of shareholders and stock shares are owned and traded privately. 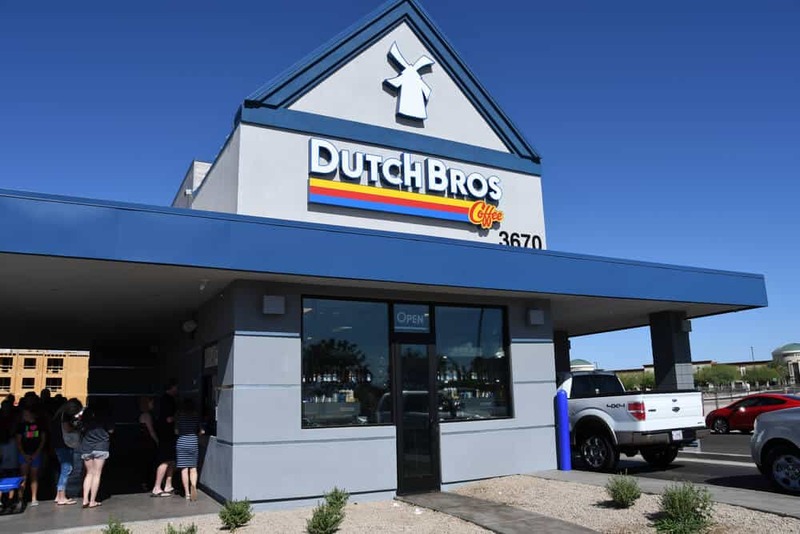 Their website purports them to be America’s “largest, privately held drive-thru coffee company.” Dutch Bros. Coffee has developed their own coffee roast, their own cold brew, and even their own energy drink, called Blue Rebel. They are known for having creative coffee drinks such as the “ER 911,” the “Annihilator” and the “Why Bother,” which is a fat-free, sugar-free decaf coffee. Other than coffee, they sell lemonades, sodas, smoothies, and kids drinks. Their regular Dutch Coffee comes in one size, 20 ounces, and has 256 mg of caffeine, or 12.8 mg per ounce. The “ER-911” has 384mg of caffeine no matter which size you order (not sure how that works), and the “Annihilator” has 128mg per 12-ounces. Is Coffee the Most Caffeinated Drink? Brewed or drip coffee averages at around 160 mg of caffeine for an 8-ounce serving. Let’s see how it compares to other caffeinated drinks. There is some debate as to why soft-drink manufacturers include caffeine in their drink formulas. 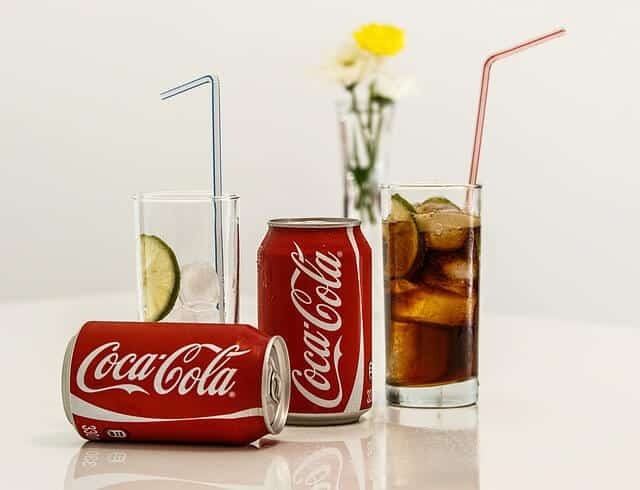 Coca-Cola states that caffeine is a flavor enhancer and helps to balance the sweetness of the sugar. Plausible. 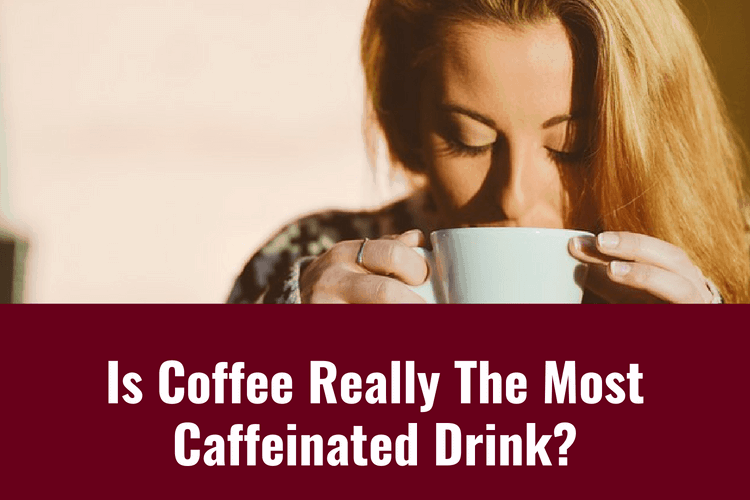 But some believe caffeine is really included to give the consumer a little jolt while drinking it, and skeptics believe caffeine is added for addictive purposes. Whatever the reason, most soft drinks are caffeinated. The following caffeine amounts are all for a standard 12-ounce serving. Both Mountain Dew and Diet Mountain Dew contain the highest amount of caffeine at 55 mg each. Pepsi One has 54 mg, while regular Pepsi has 37.5 mg and Diet Pepsi has 36 mg. Diet Coke has 46.5 mg while regular Coke has 34.5 mg. Dr Pepper has 41 mg of caffeine while Diet Dr Pepper has 39 mg.
Black, green, oolong, and white tea comes from the camellia sinensis plant and, like the coffee bean, is naturally caffeinated. The following caffeine amounts are based on 8-ounce servings. Black tea contains around 47 mg of caffeine, Oolong tea has 37 mg, White tea has 28 mg, and green tea has the lowest at around 25mg. 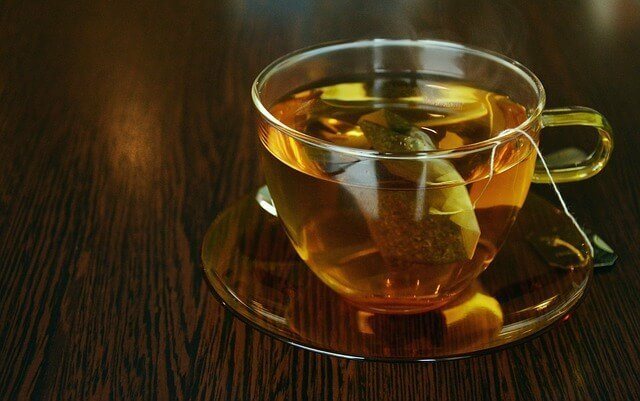 Herbal teas such as rooibos or chamomile do not come from the camellia sinensis plant and therefore contain no caffeine, as do fruit based teas, and are good choices for a pre-bedtime beverage. The sole purpose of an “energy drink” is to deliver a blast of caffeine in a short amount of time. They are generally smaller sized, even shot sized, as flavor is not usually a priority. They often have a distinct aftertaste that is not altogether pleasant. Caffeine in and of itself is quite bitter, as are high doses of things like vitamin C and B that are often found in energy drinks. Energy drinks must be consumed with care. While it’s difficult to overdose on caffeine, extremely high doses of caffeine can cause adverse reactions such as increased blood pressure, shaking, sweats, and even convulsions. Redbull has 111mg per 12 ounces, Monster M3 has 160mg per 5 ounces, Redline has 316 mg per 8 ounces, 5-Hour Energy has 200 mg per 2-ounce shot. 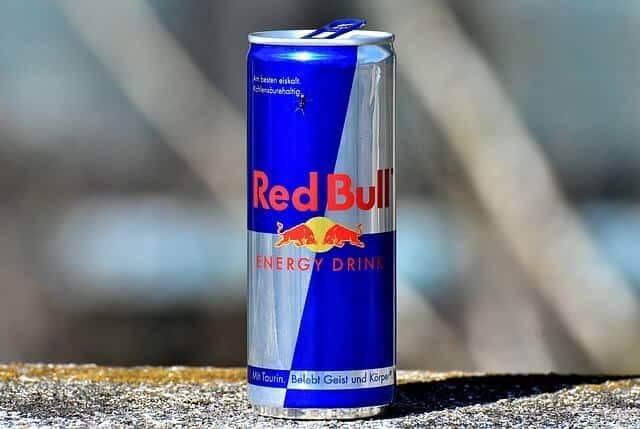 If you’re looking for a straight dose of caffeine, then look to your energy drinks but tread cautiously, particularly if you are sensitive to the effects of caffeine. On the other end, herbal and fruit teas have no caffeine to be concerned about, but tease derived from the camellia sinensis plant have moderate caffeine contents. Soft drinks have more caffeine than black tea, but less than coffee. That’s a lot of information about caffeine and a lot to consider when trying to monitor how much caffeine you’re taking in each day. Coffee is as surprising to learn about as it is complex to drink. Espresso has long been considered the most caffeinated beverage you can drink, and while it is quite high per ounce, it’s often diluted with milk, syrups, or water and by the time it’s been delivered to your hand, you could have consumed twice the amount of caffeine from a large coffee cup full of drip coffee from home. Dark roasts are known for being bold and somehow we equate bold with high caffeine, but it turns out that lighter roasts contains more caffeine. Like we said in the beginning: coffee is complicated, and it’s personal.